When Winter Storm Nemo hit the Northeast earlier this year, a lot of people living in the area received warning messages on their cellphone—but not everyone. That's because the Wireless Emergency Alerts (WEA) program that sent the messages isn't supported by all phones or all carriers' networks. 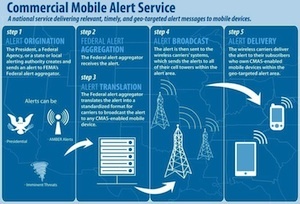 WEA, (also known as Commercial Mobile Alert System (CMAS), launched last year with all four major U.S. cell phone carriers and a handful of smaller ones as an effort to send important news straight to your device. WEA messages look like text messages and come with a unique audible sound and even vibration for the benefit of the hearing-impaired. They're short descriptions of the situation (the time a blizzard will hit, for instance) and recommendations of any actions you should take. To ensure the messages won't be delayed by cellular network congestion, the program uses a different technology from text messaging. There are three different types of WEA messages sent to all enabled devices: Presidential Alerts, Imminent Threat Alerts (natural disasters or any other situation that poses threat to life or property), and AMBER Alerts (information to help authorities find abducted children). The program sends you messages depending on your current location. So if you'd been visiting friends in Boston during Winter Storm Nemo, you'd still get an emergency alert even if your phone was purchased and registered in your home state. Since WEA messages aren't text messages, you'll get WEA messages even if you've blocked your number from getting text messages. You also don't have to pay for any alerts you receive. Unfortunately, not every handset is WEA-enabled, so if you want to receive alerts, you have to make sure yours is. With tornado season upon us, it's more important than ever to make sure your smartphone can receive official warnings (or at least have a tornado app installed and running.) If you recently purchased a new phone, whether it's a smartphones or feature phone, it may receive emergency alerts. Check out the box your phone came in for a sticker that says "Wireless Emergency Alerts Capable. AT&T: The carrier has 11 WEA-capable phones, including the Samsung Galaxy S II and many BlackBerry devices. Note that its LTE network doesn't support the program, so if you have an AT&T LTE phone—the iPhone 5, for instance—you won't be getting emergency alerts for now. Verizon Wireless: Verizon's more robust list, on the other hand, includes the iPhone 4S (upgraded to iOS 6) and the iPhone 5, as well as the HTC Droid Incredible 4G, the Motorola Droid Razr Maxx, and the Samsung Galaxy SIII, among 33 other devices. Sprint: Sprint's website lists 12 devices, including the Samsung Galaxy S II and the Epic 4G Touch, the HTC Evo 3D and the Design 4G. If you have any of the phones listed, dial ##CMAS# on your keypad, then access Settings for Messaging to activate Imminent Threat and AMBER alerts. T-Mobile: There are 15 devices on T-Mobile's list, including the Samsung Galaxy S III, the Nexus 4 and the Nokia Lumia 810. Note that even if you have any of the devices listed on your carrier's website, you might still have to upgrade its software. If you have an iPhone 4S with Verizon, for instance, you have to upgrade it to iOS 6 to activate WEA alerts. The carrier websites listed above might not have been updated recently, though. Call your carrier to ask about your handset if you're still unsure whether it's WEA-capable or not. In case you decide to opt out of WEA alerts in the future, know that you can only unsubscribe from Imminent Threat and AMBER alerts—presidential alerts are there to stay. But as WEA messages are useful on top of being free, there's really no harm in being fully informed. This is an interesting solution but I am wondering how this translates for us in the great white north in Canada? I would suggest you also look at Ping4 Alerts http://www.ping4.com who have taken the technology to new levels.